Do you know that restoring your deleted iPhone apps/software can be done without iTunes? Yes, many other tools and software can function efficiently in restoring your iPhone apps/software efficiently without iTunes. Why Should You Restore iPhone Apps/Software? 1. When experiencing iOS software crash and you eventually lost some or all iOS your Apps. 2. When you’re having some flashback issues, and you need to restore your iOS apps/software. 3. When upgrading from iPhone 7 to the new iPhone X, and you need to restore all your media files, data, and apps. 4. When an iPhone app/software has accumulated excess fragments, and you need to uninstall the app to erase the caches and fragments. 5. After resetting your iPhone to factory settings and you need to restore your iOS apps. iTunes is crunchy, old, and complicated. It’s not friendly for users who are not tech inclined. Therefore, if you desire to restore your iPhone apps/software without iTunes, then follow the tips we’ve shared on this post to learn ways to restore your iPhone software without iTunes. In the following paragraphs, we shall be throwing light on the methods by which you can restore your iPhone software without iTunes. You can re-download your purchased apps from App Store, but this app restore feature is only for purchased apps. Before you can restore your Phone apps/software from App Store, firstly, you’ll have to sign in with your App IP with which you used to purchase such files. Secondary, you’ll need to have the latest version of iOS on your iPhone. Open the App Store app, and click “Today” at the bottom of the screen. Tap the image icon or your photo at the upper-right corner of your screen, then click “Purchased”. Click “Not on this iPhone”. From the list of apps, find the one you want to restore and click on the download icon. The app will download on your iPhone. It’s easier to restore your iPhone apps/software via iCloud than via App Store. If your iPhone apps are well backed up on iCloud, then you can restore your iPhone apps or even set up your iPhone from iCloud. But before you try to restore your iPhone apps from iCloud make sure your iPhone is connected to a Wi-Fi network, and a power source. On your iPhone, launch your Settings app, then click “General > Software Update”. After updating your iOS, click “Settings > [your name] > iCloud > Storage > Manage Storage. Choose your device and click on it to see the date and size of its latest backup. Go to “Settings > General > Reset > Erase all Content and settings”. On the App & Data screen, click “Restore from iCloud Backup”. Sign in to iCloud. Then click “Choose Backup” and choose from your list of available latest backups. Your device settings and apps will be restored from iCloud. All your purchased items including purchased apps will be automatically downloaded. iMyFone TunesMate is a PC-based tool that can manage and transfer iOS data from PC to iPhone or from iPhone to PC. If you’ve recently backed up your iPhone data to iTunes, then you can easily restore them back to your iPhone using TunesMate. This is just a feature among the multiple features of iMyFone TunesMate. Moreover, you can restore all types of iOS data back to iPhone using TunesMate. TunesMate can transfer data from unlimited iTunes libraries to an unlimited number of iDevices. iTunes library can be transferred without password using iMyFone TunesMate. 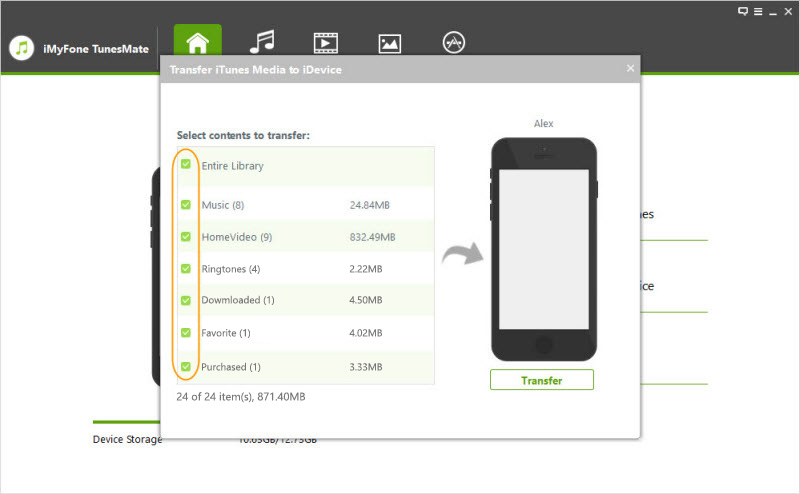 All files both free and purchased are supported by TunesMate for transfer. TunesMate lets you preview through the iPhone apps/software you want to restore before transferring them to your iTunes. You can use TunesMate to sync iPhone files or data without losing or tampering with the original version of the files or data. Step 3: Make sure the files you want to transfer is checked, then click “Transfer”. 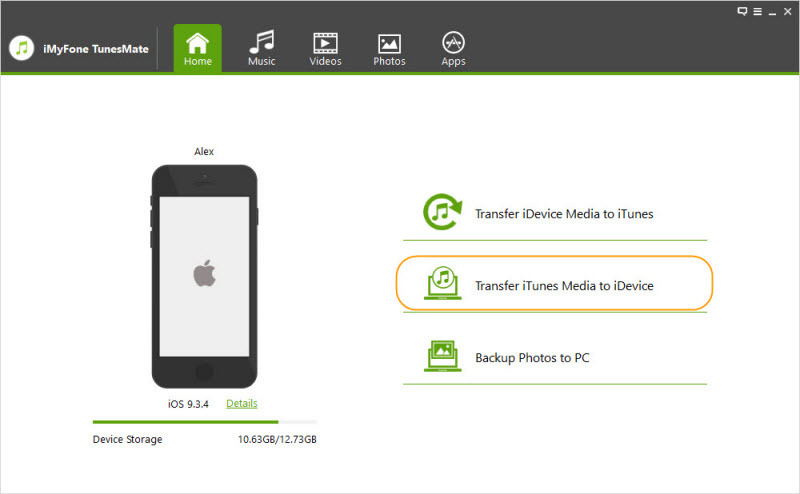 Your iPhone media files will be restored at the end of the transfer process.